Qantas’s first Boeing 787-9 will begin commercial passenger service on Wednesday on the Melbourne-Perth route. The aircraft, VH-ZNA Great Southern Land, will operate QF481, which is scheduled to depart Melbourne at 1750 and arrive in Perth at 1830 local time. 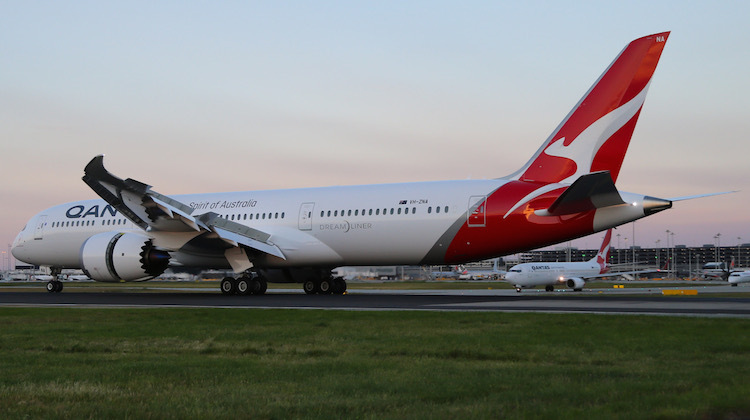 Qantas said on Wednesday VH-ZNA would receive an Airservices Aviation Rescue and Fire Fighting (ARFF) monitor cross at Melbourne Tullamarine prior to departure. Further, residents of Perth would be able to get a closer look at the next generation widebody when, subject to weather and air traffic control, the flight conducts a low flyover over the city at about 2,000 feet prior to landing. After an overnight stop in Perth, VH-ZNA will operate QF762 back to Melbourne, which is due to depart at 0800 and land at 1425. While the 787-9 has been earmarked to start Melbourne-Los Angeles flights from December and Melbourne-Perth-London flights from March 2018, there will be a six-week period where the aircraft is used on domestic services. This is for crew familiarisation for the entry into service of a new type, as pilots, cabin crew, engineers, ground crew and other airport staff prepare for the start of long-haul international services. Qantas is expected to receive the second of eight 787-9s on firm order in early December, with the third to follow in January 2018 and number four to come in mid-March. All four aircraft will be based in Melbourne. Aircraft five to eight were due to be delivered between July and November 2018 and be based in Brisbane. Qantas is configuring its 787-9s with 236 seats comprising 42 seats in business class in a 1-2-1 configuration offering direct aisle access for every passenger, 28 in premium economy laid out 2-3-2 across and 166 in economy in a 3-3-3 layout with 32in seat pitch and 17.2in seat width. Beyond the pair of flights on Wednesday and Thursday, Qantas said the 787-9 would operate a return service between Melbourne and Perth every weekday between November 3 and December 15 – QF775 departing Melbourne at 0710 and QF772 departing Perth at 0955. While no other routes or services were announced on Wednesday, the Airline Route website has reported there would also be some Melbourne-Sydney flights, as well as a number of one-off flights Melbourne to Adelaide, Brisbane and Canberra. There would also be more domestic flights in February and March 2018. Why is it there are fancy new planes with associated hoohaa but they usually offer less room than predecessors? You can blame the airlines for ruining the 787 passenger experience. Except for Japan Airlines, they make everyone else feel like a LCC. 17 hrs Perth to London cramped in economy on a not so good 787 flown them several times …Boring aircraft and most airline food is fit for pigs these days. I am talking about about airlines out of Australia, air new zealand having the worst food i have ever been served between SYD and SFO and it was identical crap coming home. Not to mention the dreadful seating..
Qantas have stated on the booking section of the website that QF93 & 94 between 10 Feb and 24 Mar on Mon, Tues, Thurs and Sat will be operated by the B789 instead of the A380. Anyone know why? I thought QF95 and 96 were the B789 flights. I agree with you Graham re the wonderful A380. Great in every way. Add Singapore Airlines into the equation and you have the best combination. Wonderful. Their A350’s are amazing also. Is 3 toilets enough for Business/Premium Economy passengers (70 seats) for the long Perth-London-Perth flights ? I’m guessing the pilots/cabin crew will also be using these ones. But all the best Qantas. Having flown the SIA A380 you cannot beat the seat comfort, the quality of cabin staff care and the superb food. QANTAS has a lot to learn. Do the Crew Rest Compartments (CRCs) have their own toilet? Perhaps ultra long haul should have Passenger Rest Compartments.